A man who stabbed a father-of-two to death on a busy high street has been jailed for 18 years. 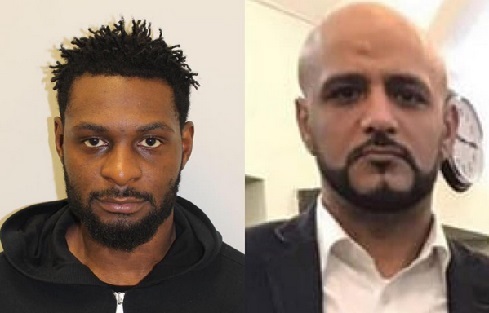 Abraham Omotoso, 27, of Tudor Gardens, Harrow, plunged a knife into the chest of 34-year-old Mohamed Al-Zufairi in High Street, Wealdstone in February this year. Mr Al-Zufairi, from Harrow, had been waiting outside Poundland for his eight-year-old daughter when he was attacked. She did not witness her father being stabbed. Omotoso was found guilty of manslaughter at the Old Bailey and will serve 18 years behind bars for his crime. Investigating officer detective inspector Jon Meager said: “This was a brutal attack in a busy high street which resulted in a young father losing his life. “While his daughter did not witness the assault, it is something that is undoubtedly going to affect her for life. In a statement, the victim’s brother, Jafar, explained how his family was still coming to terms with what happened. He added that the ordeal has had a particular impact on his niece, as she was out shopping with her father at the time he was killed. “It’s like a massive hole just suddenly appeared in our family, our big brother was there one minute and suddenly he was snatched away. None of us can get a grasp of or understand,” he said. “I think it has hit his daughter the hardest. She did not see her dad being stabbed, but was with him. “She walked to the local shops to get some sweets with her dad and returned home without him. “She was the last one with, holding his hand as she says ‘Daddy never came home with me'. CCTV footage of the incident showed Omotoso walking in a “purposeful” manner before approaching Mr Al-Zufairi. Witnesses reported a short argument between the pair before Omotoso stabbed his victim and fled the scene. He was arrested at Gatwick Airport the next day having just bought a one-way ticket to Nigeria with cash. Police believe the motive for the killing was an ongoing feud between the victim’s brothers and Omotoso’s brothers and friends.